It’s been a sizzling start to the summer for Omlet, with lots of exciting things going on. Aside the annual bbq and several visits from the ice cream van, we’ve welcomed the arrival of two new guinea pigs and two fantastic new products. See more on that below. The other fabulous news for you all is that we have some cracking summer offers for you throughout August. Get free uk delivery on all orders over £50, add in free starter packs with Eglus and Qutes, and save a bundle! Qute now in Two New Colours! Qute is now available in two brand new colours, making it easier than ever to find a small pet house to fit in with your interior. Unlike other hamster and gerbil cages, there’s no need to hide this away, because the contemporary design is so stylish that you will want it on display. Whether next to your child’s bed or in the living room, Qute will look like part of the furniture. You’ll find that it’s pretty handy for storing things on too. With wipe clean finishes in modern White, sophisticated Walnut and sleek Birch, you can be sure to find a Qute to suit your home, and your pets will love all the extra attention they get when they are in a house that’s on display. Qute has loads of other great features too, including the innovative Lift ‘n’ Twist Tube and 1 Minute Clean. Watch our brand new video now to see why Qute could be the hamster and gerbil cage for you! If you watched ITV’s This Morning on Wednesday you might have spotted a familiar face. Omlet resident Bruce the hamster was on set with Eammon and Ruth, demonstrating his lovely new home, a Birch Style Qute. Bruce nipped up and down the tube, stuffed his cheeks with food, and gave his best pout, and we think the presenters were rather taken by him. The Qute was popular too, with Paul, the vet, recommending it for its roomy size, and interior-friendly style. The Go Hutch also featured on the Pet Clinic slot, but our guinea pigs were a little more camera shy. Paul thought it was a great choice of house, offering a cosy home and outdoor space all in one. You can watch the episode here, and you’ll need to skip to 1 hour 9 minutes in to watch our latest stars. Warning. There’s a giant cockerel on the loose in London! If you’ve been to Trafalgar Square recently you may have spotted him…after all, at 15 foot high, he is rather hard to miss. The huge, bright blue bird is currently residing on the Fourth Plinth, where he will be roosting for the next 18 months. If you haven’t spotted him yet you have plenty of time to go and say hello. The Fourth Plinth has been home to many weird and wonderful works of art over the last 15 years, and it aims to showcase contemporary art and trigger public debate about art in London’s public spaces. There has been a mixed reaction to the latest sculpture, and you can see what people thought to the unveiling on this video. Now, this is one handsome cockerel, and we think he should have a name. Send us your suggestions and we will choose our favourite name. The winner will receive a Chicken Doorstop, Rooster Egg Cup and Chicken Cluck Mug. Email us, post your entry on our Facebook page or send us a tweet by midnight Sunday 4th August. Good cluck! 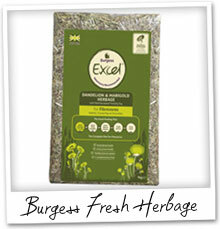 Burgess Fresh Herbage – Treat your pets to the best! This is a delicious, comlementary food made from Timothy Hay with dandelion and marigold. It is an excellent source of fibre, good for dental and digestive health. Buy a 1kg bag for £6.00, and why not check out the rest of the Burgess range too!? 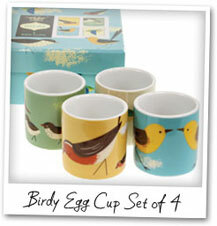 Birdy Set of 4 Egg Cups – A delightful set of egg cups for a real breakfast tweet. The pretty pastel colours and quirky bird prints will give you a bright and chirpy start to every day. Matching Espresso Set available. 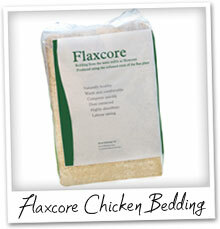 Flaxcore Poultry Bedding – This is a brilliant new bedding for chicken keepers. Made from the straw of the Flax (linseed) plant, this is much finer than hemp, with a small particle size for comfort. This 20kg pack is great value at £9.49!